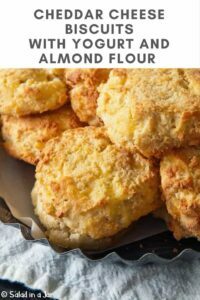 Cheddar Cheese Biscuits with Yogurt and Almond Flour are a satisfying, tasty, and low-carb replacement for traditional buttermilk biscuits. These biscuits are too good to be true. HONESTLY! I no longer miss traditional buttermilk biscuits made with wheat flour. Almond flour is the main player, but the Cheddar cheese puts these on my A-list. They aren’t exactly the biscuits you may have grown up eating (especially if you ate mostly canned biscuits like me), but they satisfy my craving for bread. I especially enjoy them with soup or for breakfast in an egg sandwich or even, grain-free Eggs Benedict. Because it’s easiest to portion these out with an ice cream scoop, they are similar to drop biscuits. If you wet your fingers, you can tap them down just a little to make a smooth top so they will cook more evenly. But don’t smash them too much. The crust is brown and crunchy while the insides are tender and have the taste of natural sweetness found in almonds. Eat with jelly or split and toast in a skillet. They freeze well. 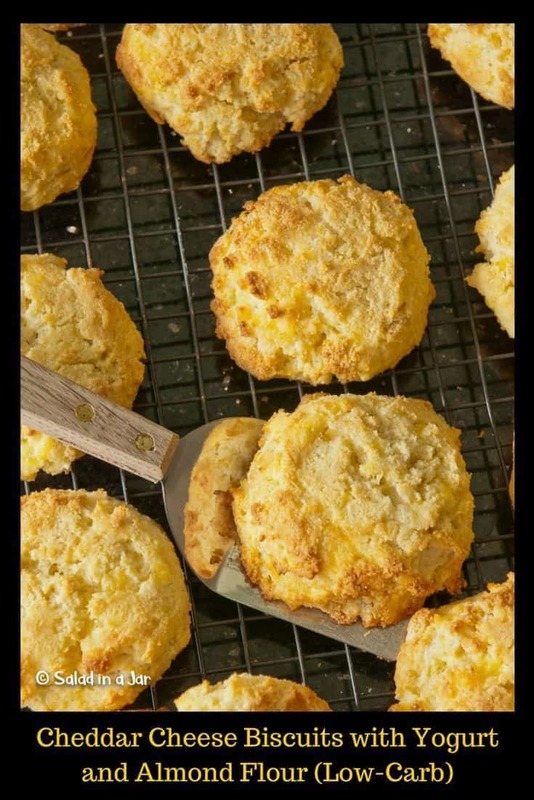 These Low-Carb Cheddar Cheese Biscuits are also grain-free, gluten-free, high-protein, sugar-free and HIGH-FLAVOR! In other news, I recently returned from a trip to North Carolina to visit my younger sister. I met my older sister in Nashville and we drove to N.C. where we snapped this picture. Since these two are often mentioned on this blog, I thought you might enjoy seeing an updated photo. 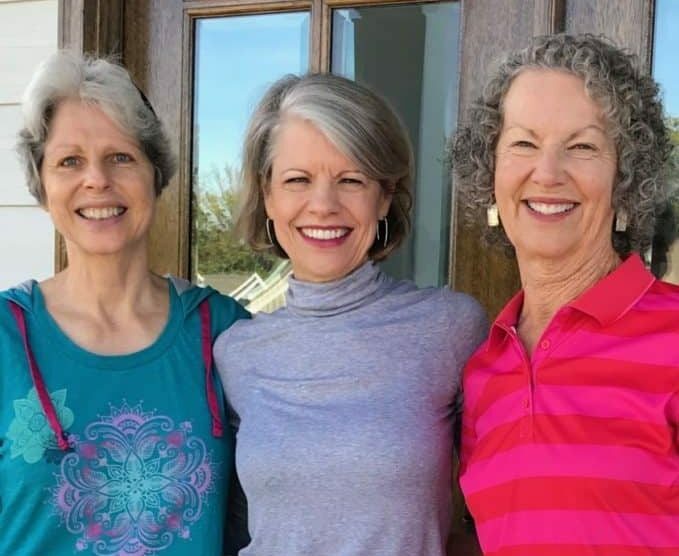 Bonnie on the left is the youngest, and Kay on the right is the oldest wisest. Stir first four ingredients together in medium bowl. Add butter and cut into almond flour mixture until it resembles coarse oatmeal. Combine eggs and smaller amount of yogurt in a separate bowl before adding to dry mixture. Add shredded Cheddar cheese and stir until all flour is lightly moistened. If dough seems dry, add slightly more yogurt. Use an ice cream scoop or two spoons to dip biscuit dough onto a greased cookie sheet. 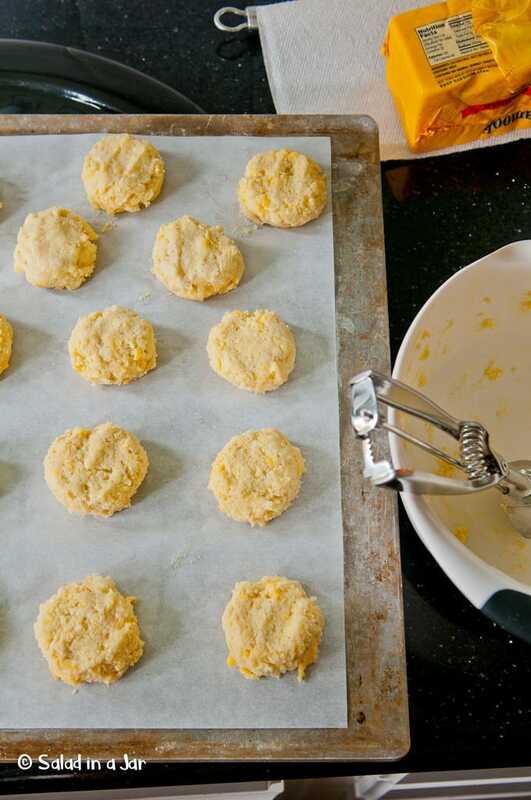 With damp fingers, lightly tamp each biscuit to give it a flat top but don’t flatten. 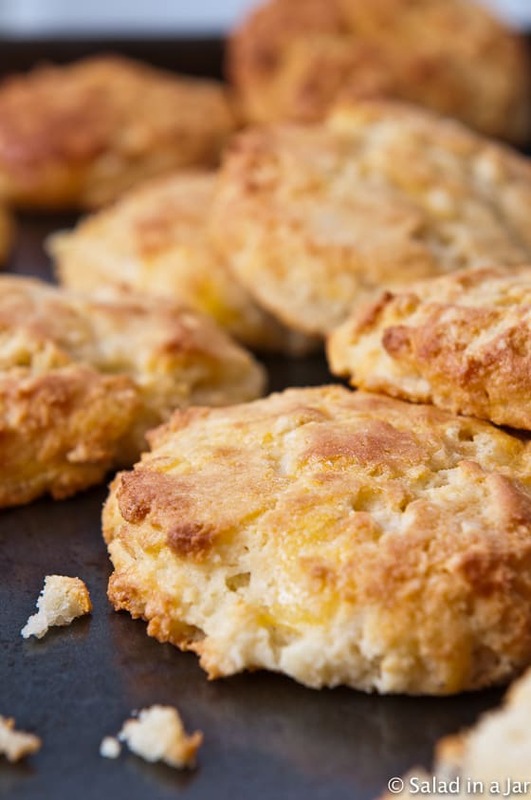 Biscuits are somewhat fragile when warm, so give them time to cool. These freeze well. Split in half and toast the cut half to make a delicious breakfast sandwich. This is the best recipe I have come across for gluten free, low carb biscuits. I live the cheddar cheese flavor; it smells so good when I repeat them in the toaster. I have modified the recipe to make a blueberry scone. I use mozzarella cheese, stevia and blueberries. I have also made cinnamon chip. Your variations sound delicious. I agree with you about the toaster. Thanks for sharing. This looks so yummy! Do you know what the carb count is? 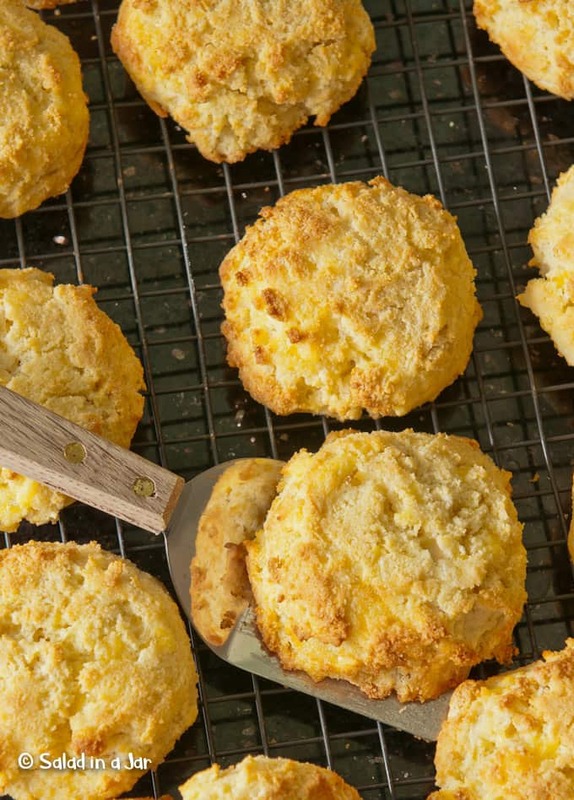 Based on 16 biscuits per recipe, there are 3.4 grams of carbs per biscuit. I added a recipe analysis to the post in case you have other nutritional questions. Thank-you Mai. Our times together make us smile. Paula, I am definitely trying these. 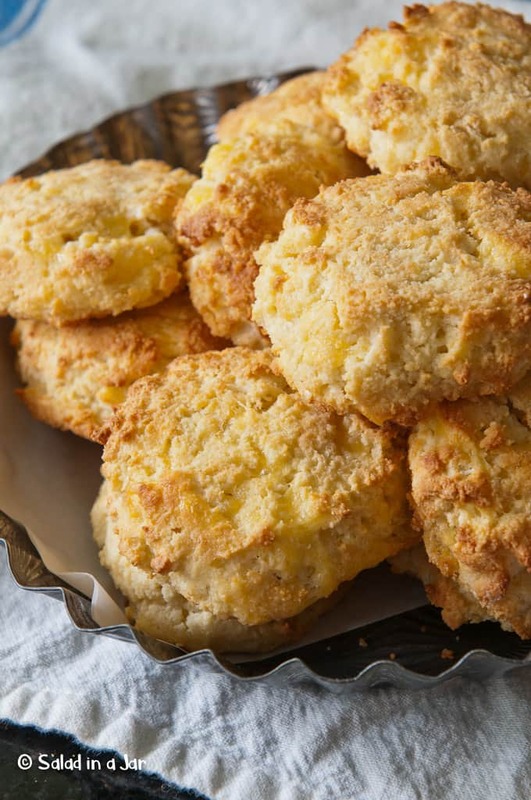 I love cheese biscuits, and biscuits in general, but gave them up long ago. Thanks for this recipe! Hope you like them. They are definitely easy.